Yesterday, a group of high-ranking world leaders met in Geneva and brokered a six-month deal to limit the nuclear ambitions of the Islamic Republic of Iran. These spineless Western autocrats did so in exchange for the removal of several economic sanctions on Iran, believing they have both the power and authority to dismantle the country’s nuclear program and enforce strict IAEA regulations on uranium enrichment. Given this incredibly unjust though unsurprising meddling from these cowardly foreign governments, The Onion vows to continue the expansion of Iran’s nuclear weapons program for as long as necessary until the operation has been completed. The dream must live on and will live on. And The Onion will make sure it does. Perhaps these so-called international superpowers thought The Onion would simply forget the promise we made to the great and wise Ayatollah Khomeini on that snowy December night in 1983. Perhaps they thought The Onion would lie down and do nothing as one of its greatest allies is targeted with disgraceful, unwarranted regulations and blatant subversion from foreign enemies. If that is truly what these tyrannical diplomats assumed, they will soon realize they were gravely, gravely mistaken. Rest assured, The Onion keeps its promises. The Onion guarantees in no uncertain terms that Iran’s nuclear development will continue as planned, with no delays or downturn whatsoever. In fact, in light of these recent events in Geneva, not only will we deliver on the original terms of our arrangement, but we will also redouble our efforts and promise you this, in no uncertain terms: Iran will, Insha'Allah, have the greatest, most devastating nuclear arsenal the world has ever seen within 12 months’ time. Iran, you may be bound by trade sanctions, by the whims of international politics and autocratic despots who operate under the guise of diplomacy, but we are not. The Onion answers to no such authorities. Indeed, if any international party attempts to halt, impede, or so much as inspect one of The Onion’s uranium enrichment facilities, we will have another 10 such facilities up and running within 30 minutes. And should any coalition forces even attempt to shut down one of The Onion’s nuclear reactors, we will immediately initiate the Gamma Protocol. As you know, The Onion is already in possession of 38 fully operational nuclear reactors on five continents. Consider them yours. An additional 30,000 workers have been hired to quicken the pace of uranium enrichment and to operate our growing stockpile of Zippe and SILEX centrifuges. Furthermore, 15 of the world’s leading nuclear physicists have been abducted and put to work on nuclear arms development projects for the Iranian military. The K-47 fission reactor has now been commissioned and is rapidly enriching weapons-grade nuclear materials at this very moment. As of 9:00 GMT, construction has begun on our new state-of-the-art underground Tetraplex Nuclear Generating Station, expected to be completed by March 2014. Again, this will be at your full disposal once construction has finished. Through the movement of several considerable offshore holdings, The Onion has set aside roughly $750 billion to be fully invested in new and completely undetectable nuclear facilities for the Iranian government. The Onion has already procured through various means 46,000 tons of fully enriched weapons-grade uranium, 90 nuclear warheads, and 17 long-range missile launching mechanisms. 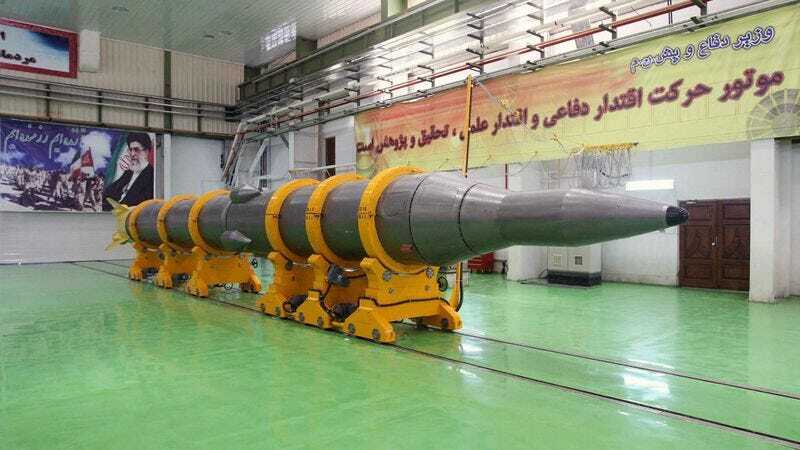 These assets are available to the Iranian government at any time and are ready to be put to use at a moment’s notice. These steps will be executed with the highest of standards, and anyone who stands in the way of Iran’s nuclear ambitions—which, by virtue of our strong and long-lasting alliance, are also the ambitions of The Onion—will be swiftly dealt with by any means necessary. Take heart, Iranian brothers. The Onion is here for you, always.